Just about the most expensive crude in North America comes from Alaska’s North Slope. Not that it’s anything all that special, unlike Copper River salmon which fetches a premium price for its high oil content, flavor and color. The geography and markets are just working in our oil-price favor. The past few months, Alaska oil has been running as much as $10 per barrel greater than the U.S. benchmark price, in a reversal of decades past when Alaska crude sold below the benchmark. As of Nov. 29, West Texas Intermediate, or WTI, crude was pegged at $51.45 per barrel on the New York Mercantile Exchange. On that same day, Alaska North crude sold for $60.46, according to the Alaska Department of Revenue, which compiles the numbers on a one- or two-day lag because ANS oil isn’t traded on a public commodities exchange. If it holds for a full fiscal year, a $10 spread for Alaska oil could be worth a few hundred million dollars to the state general fund, according to Department of Revenue tables. But no rejoicing over any surprise windfall — the price differential and its extra dollars already are counted in the department’s revenue forecast. It’s a lesson in supply-and-demand-and-price economics. While shale oil producers are pumping record amounts of crude from the Permian Basin in West Texas and New Mexico, the Bakken in North Dakota and elsewhere, those abundant supplies are driving down U.S. prices. But there isn’t the pipeline capacity across the Rockies to move that oversupply to the West Coast. Alaska crude deliveries, at around 500,000 barrels a day, are covering less than one-third of the demand at West Coast refineries. In 2017, the West Coast imported almost 1.3 million barrels per day of foreign crude, led by Saudi Arabia at 283,000 barrels a day, Canada at 228,000, Ecuador at 190,000 and Colombia at 134,000. Even Russia is there, averaging 41,000 barrels a day in 2017. Without a cost-efficient way to move more of that plentiful — and lower cost — U.S. or even Canadian oil to the West Coast, refineries have little option but to pay higher global prices for the crude they need. Alaska profits by tagging along close to Brent, named for North Sea fields and used to price more than half of the world’s internationally traded oil supply. For decades, North Slope oil sold on the West Coast for around $2 less than WTI. From 1988 — when North Slope production peaked at 2 million barrels per day — to 2012, the annual average for Alaska crude was 50 cents to $4 per barrel less than WTI. ANS production was more than West Coast refineries could handle, and a federal ban on oil exports left no option but to force a lot of Alaska crude to travel to more distant U.S. markets — aboard tankers through the Panama Canal or by pipeline across Panama, to refineries on the Gulf Coast, and for some barrels all the way up the Hudson River to a small refinery in Albany, New York. 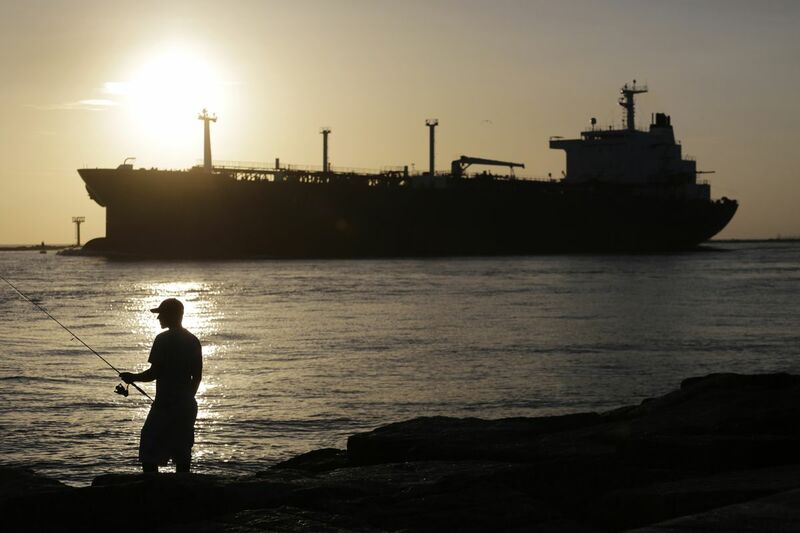 Supertankers carrying Alaska crude, too large for the Panama Canal, even sailed around South America to a refinery in the U.S. Virgin Islands. Too much supply and not enough demand on Alaska’s side of the continent meant lower prices. The switch from a small price discount to a substantial price premium started for Alaska in 2012, according to U.S. Energy Information Administration numbers. From 2012 and 2015, average U.S. crude output jumped about 1 million barrels per day each year for four years running. As all that shale oil flooded the market, the U.S. benchmark price fell away from global prices. This fall, it’s been around $10 per barrel in Alaska’s favor. All that oil also has diminished Alaska’s role in U.S. production numbers. At its peak, Alaska provided about 25 percent of the country’s oil output. We’re now down to less than 5 percent. The Energy Information Administration estimated the country’s total production at a record 11.7 million barrels per day the third week of November. The number was 5 million barrels per day in 2008. At 11.7 million, the U.S. is outproducing Saudi Arabia. It’s all about shale. The EIA expects shale oil production to average almost 8 million barrels per day in December. The agency said Nov. 13 that the Permian Basin alone would produce 3.7 million barrels per day in December. It’s Alaska’s good fiscal fortune that no one has put together an economically viable way to move much of that shale oil to the West Coast, which could wreck the supply-and-demand sweet spot for North Slope crude. Some Bakken oil moves by rail to refineries in Anacortes, Wash., but not enough to knock down Alaska prices. And despite years of struggles to build more pipeline capacity from Alberta’s oil sands to the coast — any coast — for export, little new pipe is in the ground, keeping much of the 4 million barrels per day of Western Canadian production stuck in the mid-continent — and selling at painfully deep discounts. While Alaska enjoys a premium for its oil, Western Canadian Select sold for about $15 a barrel on Nov. 29. Yes, $15. Canadian heavy oil has always been cheaper, but nowhere near that much. Without new pipeline capacity to move more of their oil to the coast for exports or to U.S. refineries, Alberta producers have to take what they can get. They are suffering so much under the deep discount that Alberta Premier Rachel Notley on Dec. 2 ordered companies to cut their production by 8.7 percent (325,000 barrels per day) in hopes of pushing up prices. A few days earlier, the premier announced that her government will buy or lease rail tank cars to move more oil until pipelines can be built. But moving crude by rail at 700 barrels per tank car is expensive, and not always well received by residents watching the long trains roll through their community.